Jerry Heasley's Rare Finds: Mustangs and Fords. The Hunt for the Ultimate Ford Muscle Cars. This is a brand new book that just arrived, and I really like it. It is called Jerry Heasley's Rare Finds: Mustangs & Fords. Whew! That's a big list of thirty, and thirty very interesting stories. During the 1960s and 1970s, all the major Detroit manufacturers made legendary muscle cars, and Ford was no exception. Shelby Mustangs, Cobra Jet Mach 1s, big-block and Hi-PO GTs, Boss and Talladega prototypes, K codes, S codes, and R codes, all familiar terms to Ford performance enthusiasts. Shockingly, even with how popular many of these models were, there are still long-lost examples turning up in barns, garages, backyards, and yes, pastures. Some of these lost Mustangs and Fords were forgotten by owners, shuffled between family members, or simply parked to become non-descript garage fixtures. Some have lived hard lives on the street and in competition, and then been neglected and abandoned. Many of these Mustangs and Fords are among the most valuable and collectible cars Ford has ever built. These automotive jewels have been waiting for a dedicated enthusiast to rescue them from obscurity. In order to find these rare rides, collectors have had to do extensive research, fact checking, searching off-the-beaten-path locales, and make hundreds of phone calls. As the automotive Indiana Jones, Jerry Heasley has been tracking down and documenting the stories of the rarest and most sought-after Mustang and high-performance Ford rescue stories for years. 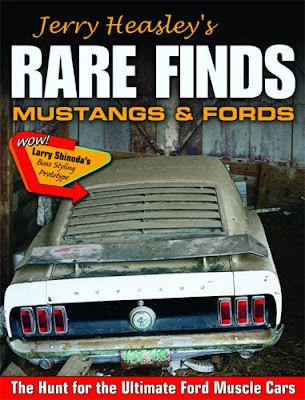 In this follow-up to the top-selling Jerry Heasley's Rare Finds, Heasley has built a collection of his finest stories, including the 1969 Boss styling prototype that was owned by Ford stylist Larry Shinoda, the original 1967 Shelby Mustang prototype that would become several other test cars, and a rare 1965 Shelby GT350R. We posted last week about the new restoration project that just arrived at Maple Hill Restoration. Being big 65-66 GT350 fans, we will be heavily involved in the research of this car along with, obviously, the restoration parts supply. Today, we have lots of detail shots for you geeks like us. If you regularly read our Blog, you are probably used to these type of images. Be sure to take a close look at each image. This car is in very nice condition. Check out the images of the original 289 Alternator Belt and those super nice ten spoke wheels! 1966 GT350 Shelby Mustang. This is some awesome original paint which will enable us to match the original Sapphire Blue color. 1966 GT350 Shelby Mustang. 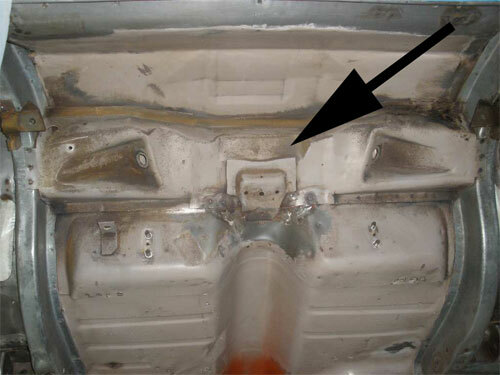 The original Mustang Data Plates were removed from the LH Door on the '65 and '66 GT350's. Often, both data plate rivets did not come out of the holes. Here you can see that one original rivet is still in place. 1966 GT350 Shelby Mustang. This is the original cast aluminum 10 spoke wheel. All five are in beautiful original condition. 1966 GT350 Shelby Mustang. This Shelby was produced early enough to be equipped with the Koni Shocks. It still retains one of the original, unbroken "axle limiting" cables. These cables were actually used to limit the travel of the rear Koni shocks. 1966 GT350 Shelby Mustang. The floors in this car are in exceptional condition. 1966 GT350 Shelby Mustang. This is a close up shot of the original 289 HiPo fan / alternator belt. I don't think I have ever seen an original. 1966 GT350 Shelby Mustang. Here is one of the date stamped horns for you detail geeks. 1966 GT350 Shelby Mustang. How about the original 289 High Performance Air Cleaner Decal? 1966 GT350 Shelby Mustang. Check out the original Shelby American, Inc step plate label. 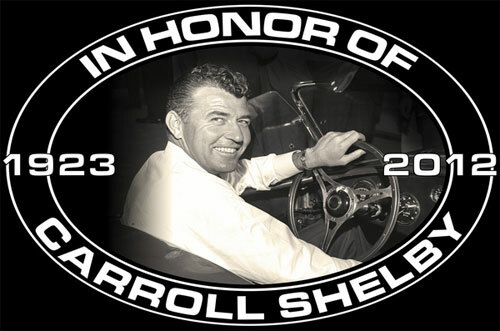 New Carroll Shelby Memorial Metal Sign. We have a great selection of cool metal signs featuring various Ford Mustang and Shelby logos, cars and vintage pictures. Here are our two latest signs. Both are 11" x 17" powder coated metal signs with the images embedded in vibrant color. The part number on the Memorial Carroll Shelby sign is AC-469. The other new sign below was made from a scan of a Shelby Parts Accessory Catalog Cover. It is our part number AC-468. This new metal sign is a photo print from an original Shelby Parts Accessory Catalog. 1966 Mustang Shelby GT350. It is the latest restoration project. An exciting car just arrived at Maple Hill Restoration. It is a Sapphire Blue 1966 Mustang Shelby GT350. This is going to make a super nice car and a complete restoration is planned. If you read our Blog, you know that we love the '65 and '66 GT350's, and you will see a lot of coverage about this car in the future. This is a super nice and complete GT350. It was purchased new at Hi-Performance Motors in California. It was originally delivered with the optional ten spoke cast aluminum wheels and a 4 speed transmission. The owner even still has the original window sticker! I can't wait to share more pictures of this car! Check out the images we have here along with the captions, and look for more here on the Virginia Classic Mustang Blog this upcoming Monday. 1966 Mustang Shelby GT350. Here is a shot of one of the original Koni front shocks. 1966 Mustang Shelby GT350. The Shelby Serial Number was stamped on the RH Front Fender Apron on the '65 and '66 GT350's. 1966 Mustang Shelby GT350. This cool car still has both of its original front fenders. This one is dated November 29th. Even though the year is not stamped, this would be 1965. 1966 Mustang Shelby GT350. The other fender is date stamped January 15th of 1966. 1966 Mustang Shelby GT350. Here is the original GT350 Serial Number plate. It appears to have never been removed. 1966 Mustang Shelby GT350. This car still has its original engine along with the Shelby Accessories such as the Cobra Valve Covers, Oil Pan and Intake Manifold. 1966 Mustang Shelby GT350. 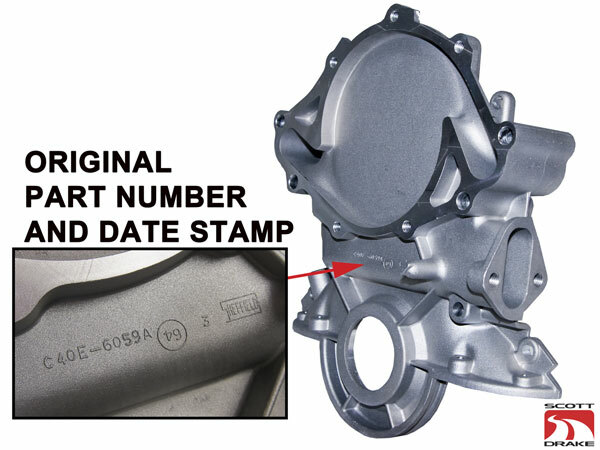 The engine assembly date stamping is 6A7M. The 6=1966, A=January, 7=7th day of the month. The "M" may be the designation for the person that did the stamping. 1966 Mustang Shelby GT350. Here is a copy of the original window sticker. This car was sold new at Hi-Performance Motors in California. It is a Sapphire Blue Shelby with the optional Ten Spoke cast aluminum wheels. It originally was delivered without LeMans stripes and without a radio. 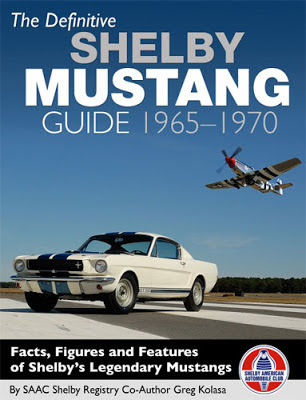 We were really excited to get this new book, The Definitive Shelby Mustang Guide: 1965-1970. Our friend and Shelby American Automobile Club (SAAC) Registry Co-Author, Greg Kolasa has been working hard to put out this great, new book. The Definitive Shelby Mustang Guide: 1965-1970 will serve as the illustrated Shelby Mustang sourcebook for years to come. For Mustang and Shelby enthusiasts especially, but even for general automotive historians, no automotive library would be complete without it. Order by clicking here - our part number is LT-183. Original Mustang Rear End Pinion Snubber Plate for 9 inch rear equipped Mustangs and Shelbys. We now have a great reproduction of the original plate that was welded to the floor on the 1965-70 Mustangs and Shelbys that were equipped with the 9 inch rear end. This plate acts as a "stop" for the pinion snubber bracket bumper, and, as mentioned, is unique to the Mustangs with the 9 inch rear end. Our part number for this new item is SM-814. Please note that a different, shorter style of this plate was used on earlier cars with an approximate build date earlier than April 1965. We now have a really nice reproduction of the timing chain cover used with the aluminum water pump on the 1964 and early 1965 260 and 289 Ford Small Block Engines in the Mustang. This one is different from the timing front cover that was used later with the cast iron water pump. This early timing chain cover is deeper where the water pump bolts on to allow clearance for the exposed impeller on the aluminum water pump. This cover is made by Scott Drake Mustang Parts from high quality die-cast aluminum like the original. It features a built in timing pointer along with the Ford engineering number, date stamp and manufacturer logo. The detail on this front cover is extremely nice. Please note that this cover does not have the provision for the oil filler tube that is found on the very early generator equipped cars. Our part number is EG-5701. Correct 1965 and 1966 Mustang and Shelby GT350 Front Disc Brake Backing Plate / Splash Shields. This is a great brand new part that has never been available as a reproduction. These new Front Disc Brake Splash Shields / Backing Plates are made just like the original 65-66 Mustang and Shelby design plates. The previous reproductions are actually copied from the '67 Mustang style splash shields. These '67 are still available and will actually fit 65-66 Mustangs while offering better venting. Now you can replace your missing, pitted or bent original splash shields with these new, correct shields. 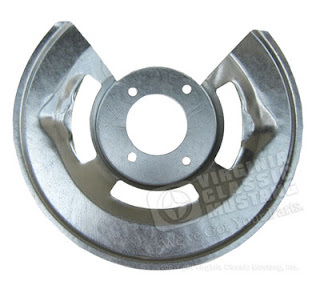 The part number on the new correct 65-66 style brake shields for the Mustang is BK-3481. These are sold as a pair. 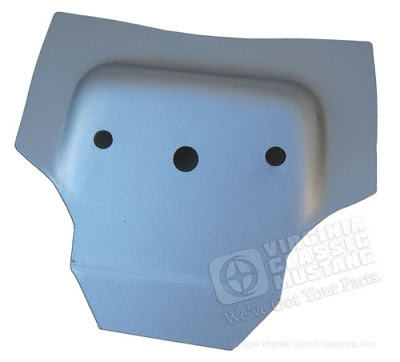 The 67 Mustang style shields are sold individually. The part numbers are BK-348L and BK-348R. 1967 Mustang Front Disc Brake Shield / Backing Plate. 1965 Mustang Convertible. Underside is painted. 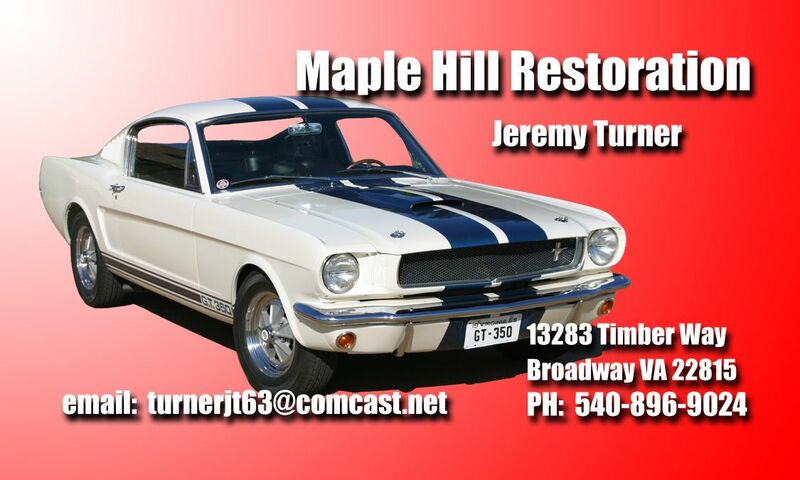 Today we have some more pictures of the 1965 Mustang Convertible being restored by Jeremy Turner at Maple Hill Restoration. You can check out Maple Hill's web site at www.MapleHillResto.com. This Mustang is being painted Twilight Turquoise. Please note that due to the flash and lighting that the color does not look exactly the same in all of these images. In this pictures, Jeremy has painted the underside of the car in the correct gloss black like original. This was matched to the original finish on this January '65 production, Dearborn plant Mustang Convertible. You can also see how the body color (Twilight Turquoise) paint was applied over the black, duplicating the original spray patterns. The engine compartment was then painted with a black that is not as glossy as the underside, again, duplicating the original finish. 1965 Mustang Convertible. Underside is painted. This image shows the Twilight Turquoise overspray. 1965 Mustang Convertible. Underside is painted. This image shows the Twilight Turquoise overspray in the rear wheel house area. 1965 Mustang Convertible. Underside is painted. This image shows area above the rear end housing. 1965 Mustang Convertible. The rear trunk brace was originally painted with a gray sealer that has been duplicated here. 1965 Mustang Convertible. Under rear deck area. 1965 Mustang Convertible. Inside of rear quarter panel area is painted a red oxide primer, duplicating the original finish. 1965 Mustang Convertible. Engine compartment is painted a semi-gloss black, duplicating the original finish. 1965 Mustang Convertible. Flowable seam sealer has been applied exactly like the original found. 1965 Mustang Convertible. Inside floor pans and dash area are painted and finished. They have been covered and taped up for the other painting. Trunk area is now ready for seam sealer and then paint on this '65 Mustang Convertible. 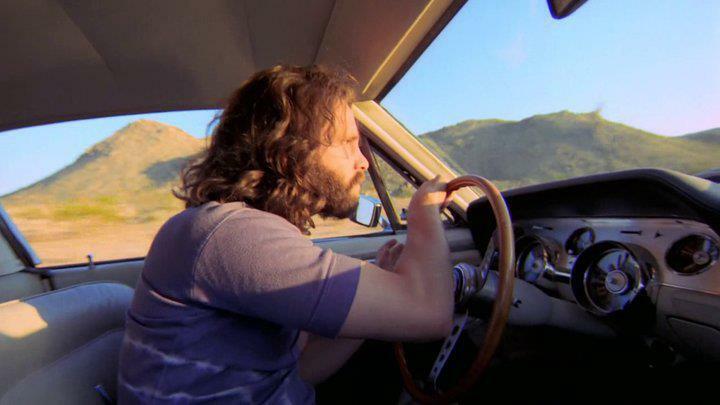 Many of our readers may know that Jim Morrison from The Doors owned a 1967 GT500 Shelby Mustang. It was nicknamed "The Blue Lady." Anyway, here are two pretty cool videos featuring the car. NOS Ford 65-66 Mustang Disc Brake Proportioning Valve. Image ©Virginia Classic Mustang Inc. I am re-posting this Blog post that was originally published in December of 2010. It was one of our more popular posts, and I've sent it to several people just this week. Also I'll mention that you can now Friend Us on Facebook! If you are really into the detail end of the 65-66 Mustang and Shelbys, you may find this post interesting. A Kelsey Hayes disc brake proportioning valve was originally installed on the 65-66 Mustangs with factory front disc brakes. Rather than discuss the function of this part, this post is more about the detail and restoration. There seems to be a widely held thought that this valve was originally a bluish-gray color. All of the New Old Stock / Ford Service parts that I have seen are certainly this color, and perhaps some of the ones originally installed on the assembly line were also this color. The "end discs" on these valves are dated. The numbers indicate the day of the year along with the year. Jeremy at Maple Hill Restoration did the paint work on this. He also does the restoration work on the 1965 Mustang 289 HiPo convertible that is featured on our Blog. He will soon start on our Carryover 1966 GT350 Shelby. 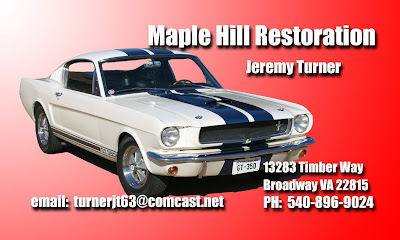 You can contact Jeremy by going to his web site at www.MapleHillResto.com.